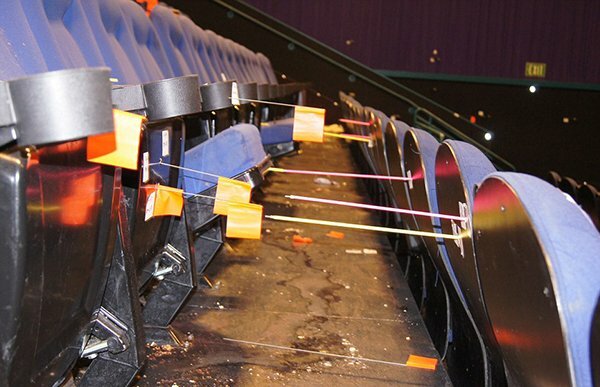 Newly released pictures showed the gruesome reality of the carnage caused by Colorado theater shooter James Holmes. In some of the photos released Thursday, investigators used red and green laser beams to track the trajectory of every bullet fired by the madman during a midnight showing of “The Dark Knight Rises” in 2012. Other photos showed the bloody aftermath of Holmes’ rampage. Holmes was sentenced last month to life in prison without parole. **WARNING** Some of the following images may be disturbing to some readers. Photo credit Arapahoe County DA Office. Photo credit Aurora Police Dept.